Reebok Iverson Collection: Wht/Red Answer out now! I3 Legacy 11/15! Unik Answer 11/17! Discussion in 'Other Brands' started by Hahahaha, Dec 1, 2017. The DMX mall walker shoes got that robust feeling ipak. Cant feel nothin in these answers tho. Picked up a pair of Question “white noise” that turned out to be samples. However, I didn’t see any difference between these and the general release version so....I decided to remove the “noisey” midsole paint. Such a pain in the *** to do but it’s going well. Love the simple og color blocking. pmpdaddyrobford, vood99, AEA18 and 9 others like this. TURBO UNO and AI'sMyGOAT like this. pmpdaddyrobford, Hahahaha and HarlemDiplomats like this. That’s Reebok’s eBay account. Those Kobe Answers hit $45 at one point, I’ll wait these out and see if they hit $50 or less. They also have buy one get one 30% off and they have these. TURBO UNO, salacious crumb, AI'sMyGOAT and 3 others like this. Dubby, TURBO UNO, AI'sMyGOAT and 1 other person like this. Picked up the Answer 1 white/red on eBay in sz 10.5. Too small for me, but I’m going to hunt down a sz 11 or wait for Reebok to have a sale. The foam gold ovals bother me, but the show overall feels almost as comfortable as the OG and their is too much nostalgia in these for me to give up on them over one thing on the shoe that bugs me. AI'sMyGOAT, da hen and TURBO UNO like this. How is it too small, the run at least half a size too big? Is the cushioning close to the original? I remember the OG black/gold and the retro in 07 (I think) being a half a size too big, so I went with a 10.5 again like back in the day. Plus there were no size 11s in the eBay sale. I’d say they fit true to size. Keep in mind I was buying them back then to play ball in and like a more snug fit, not rock casually. I’d rather have more room when just walking around. The comfort is great, but you definitely feel the “end” of the forefoot DMX, compared to the OG where you could feel it all the way to your toes. AI'sMyGOAT and jrdatrackstar23 like this. Did you get them for a decent price? The white/red I mean. @TURBO UNO , this yer pic my man ?!?! i mean ya i can read, was just wonderin, its on that solecollector AI shoe history, and if they r 10.5 or 11 u still got em in good shape ? Dubby, vood99, TheRealAlleygator and 1 other person like this. dammmmmmmmn 15-16 yrs , and havent openind box in years ! thapointguy, Dubby, vood99 and 2 others like this. Yeah, wanted to keep them on ice in case they never retro again. Reebok still hasn’t dropped them in high top navy suede toe. Unbelievable. AI'sMyGOAT and alchemist iq like this. 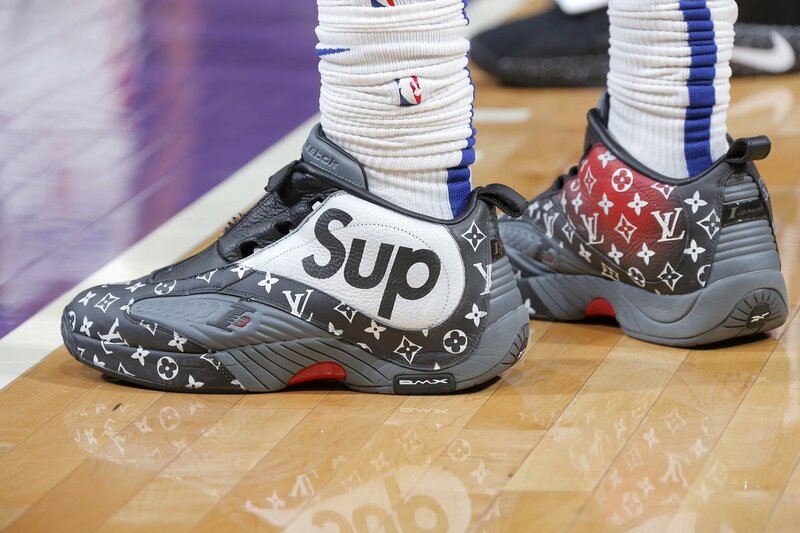 Montrez needs to chill out some of his customs are tacky as hell. gentrification, AEA18, Dubby and 6 others like this. I agree. I’m cool with color change but all the rest is too extra. vood99 and alchemist iq like this. He did the air jordan 5 with the lcd screen in the tounge, creative....but man why? To distract your opponent lol. Man took the Cash Money era approach to his kicks. AI'sMyGOAT and TURBO UNO like this.